Students at VT have the opportunity to conduct their own linguistic research, which sometimes leads to conference presentations and even publications! See some examples below! If you're interested in conducting your own research, contact one of our faculty! In Fall 2016, Language Sciences Minors Amy Southall and Rachel Hargrave collaborated with Dr. Abby Walker (ENGL) to look at /z/-devoicing in Southern American English. For their project they designed and ran an experiment that had around 40 participants. Amy presented their findings at the Southeastern Conference on Linguistics (SECOL), and Rachel Hargrave presented at the Appalachian Studies Conference (ASC). Both women received funding from the Undergraduate Research Institute for conference travel, and Rachel was also named a Fralin Undergraduate Research Fellow.They have submitted their results for publication in a linguistics journal. In Spring 2017, Language Sciences Minor Emily Walters did a collaborative project with Dr. Abby Walker (ENGL) and Jen Hay (NZILBB) on gendered words in New Zealand English. The project involved analyzing a large corpus of conversational speech and seeing the words that were said comparatively more by men or women. She received funding from the Undergraduate Research Institute to present their project at the Georgetown University Round Table (GURT). 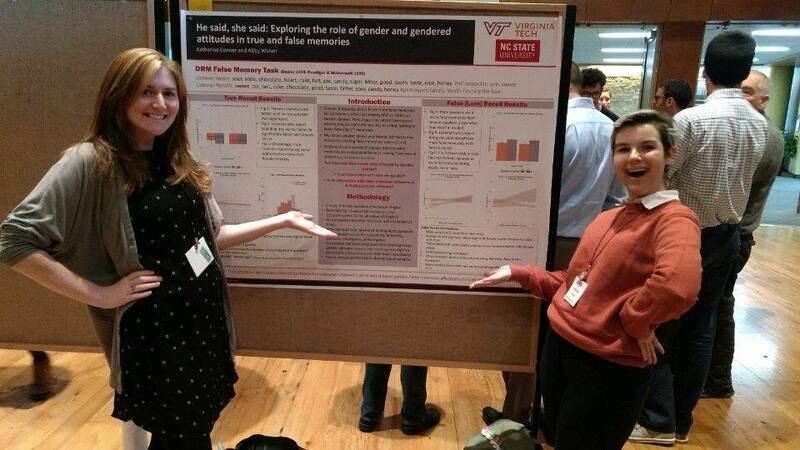 In Spring 2016, Katie Conner collaborated with Abby Walker (ENGL) to investigate the role of gender in false memories, where people report having heard a word they did not. Their study involved designing an experiment and collecting data from over 100 listeners. They presented their work at New Ways of Analyzing Variation (NWAV) in Wisconsin in 2017. After going on to do her MA in linguistics at NC State, Katie is now doing her PhD in Linguistics at Ohio State. 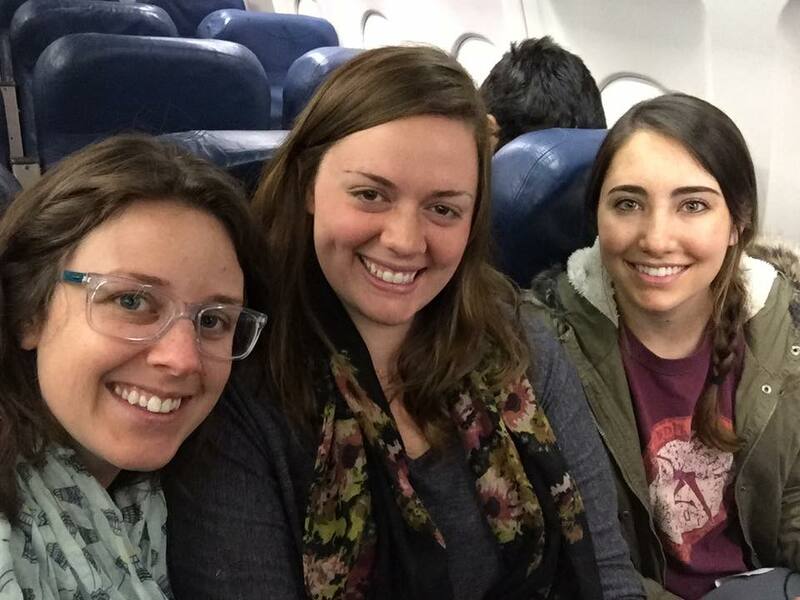 Language Sciences Minors Chelsea Rinn and Thea Stoller traveled to Austin, Texas with Dr. Katie Carmichael (ENGL) to present their research on Cajun English vowels at the Symposium about Language and Society (SALSA) in Spring 2016. Both students received undergraduate research grants that helped cover their travel expenses. 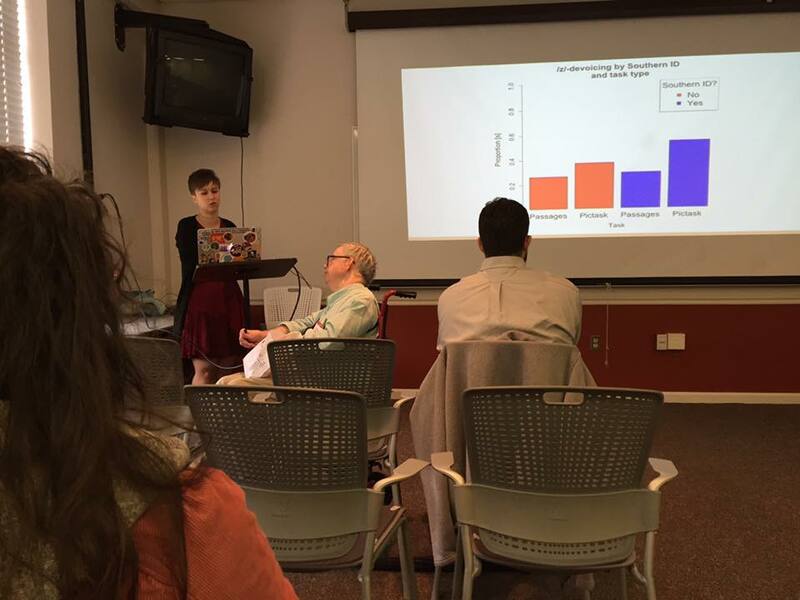 Undergraduate Linguistics Club Vice President Casey Myers (Fall 15-Spring 16) presents her poster on double modals at the Sociolinguistic Variation and Language Processing (SVALP) Conference held at Virginia Tech in Spring 2016. Her project started as a class project for Syntax, then developed into independent research with Abby Walker (ENGL). For the project, she ran an online study collecting listener judgments of double modal constructions. A write up of her study was published in vtreview! Undergraduate Linguistics Club Member Leigh Marques discusses their poster on gender-neutral anaphora resolution at the Sociolinguistic Variation and Language Processing (SVALP) Conference held at the Inn at Virginia Tech in Spring 2016. They designed their project for class in Language and Gender, then did independent research with Abby Walker (ENGL) and ran the study, which involved collecting grammatical judgments from queer and straight members of the VT community. Language Science Minors Andy and Katherine were hired by Dr. Walker (ENGL) to collect data for a project that investigated how different listeners responded to different accents in various listening tasks. She invited them on as collaborators, and they presented their work at the Sociolinguistic Variation and Language Processing (SVALP) Conference held at Virginia Tech in Spring 2016. The are writing up their results for publication in linguistics journals. After taking ENGL 4004: Discourse Analysis with Dr. Carmichael in Fall 2016, Meghan was really excited about conversations were changing over time. Since Dr. Carmichael was on maternity leave, she reached out to Dr. Walker who agreed to advise her in independent research over the next year. She presented the result of that labor - Exploring Turn-Taking and Discourse Markers through Generations - at SECOL 2018 held at Virginia Tech, and published her study in Philologia. Pictured second from left, with other VT-connected presenters at SECOL 2018.